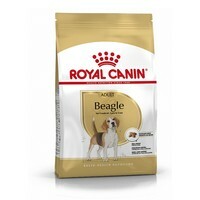 Royal Canin Beagle Adult is a complete dry feed for adult and mature Beagles over 12 months of age. The food has been made with high quality ingredients including vitamins and minerals, and has been designed specifically for the unique physiology of the Beagle breed to provide optimum support. Ideal Weight: The formula helps the Beagle to maintain an ideal weight thanks to an adapted calorie content. Food Intake Control: The kibble has been designed to reduce intake rate and encourage chewing. Bone and Joint Health: The specially formulated feed helps maintain ideal weight and support health bones and joints. Exclusive Kibble: The texture and formula have been aspecially adapted to the Beagle breed. Suitable for adult and mature Beagles over 12 months.